Without even introducing herself, Karen Kluglein was off and running in her very first sentence instructing the class in the ins and outs of painting on vellum. She gave a short talk and in just a few minutes we were sorting though piles of small pieces of various types of vellum, and trying our hand at as many as we had time to sample. I felt like a kid in a candy store! While we painted, Karen also painted, either demonstrating to four students at time, or working silently on her own piece. We were free to sit with her for as long as needed and then return to our work. 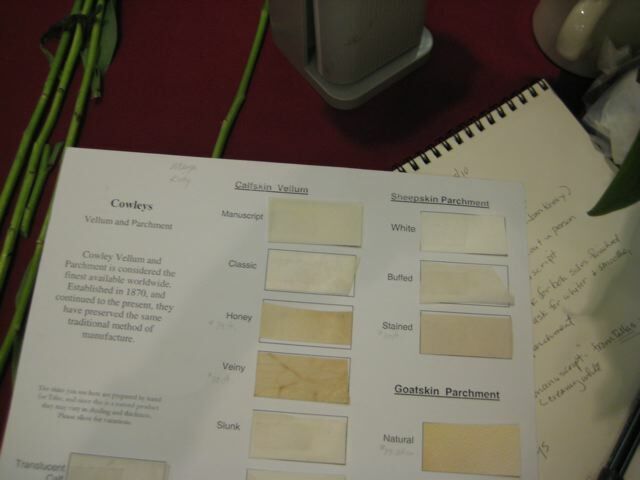 A sales representative from Pergamena was at the conference and provided the 8 x 10″ calf skin piece that was included in the class cost. However, I think that Karen usually gets her calfskin Cowleys manuscript (creamy white) from Talas. It can be ordered by phone if you can’t go to Brooklyn, NY for the fun of picking out your own pieces. Tala also sells a sample card of Cowleys (see the photo). When picking out pieces consider these points. Look for a flat piece. When framed and hung on a wall, rippling will be accented by overhead lighting. You can request pieces that are finished on both sides or only one side. 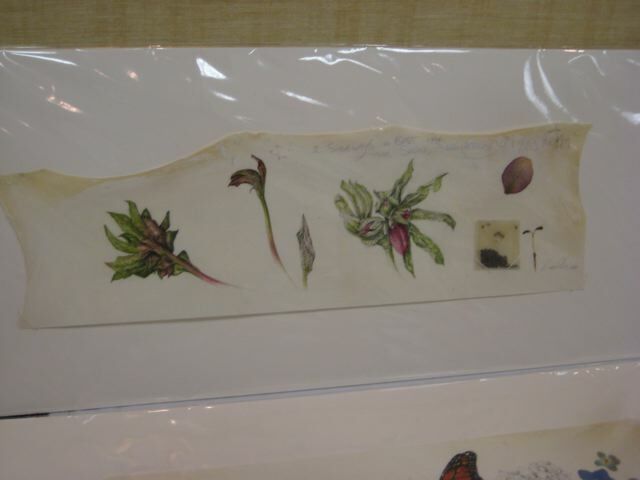 If you want “veiny vellum” you may want to pick it out in person so as to get a piece that appeals to you or complements the subject. Paint on the top side which is smoother to the touch and may show indentations from the follicles. Choose thicker pieces that are uniformly thick and even. Store flat. Vellum reacts to humidity. If it curls, it will relax later in the day. Vellum refers to calfskin, while parchment denotes sheep, which is oily and less desirable for our work. Painting on vellum is a pleasure and a torture. The key is mastering the correct amount of water. Karen began with a light wash – slightly stronger than a tea wash-that dried instantly. From then on, it was all dry brush. Our first practice was creating a smooth transition on a 1 x 2 inch scrap using a light wash under cross hatching dry brush. Karen’s demonstration was so smooth it looked printed! (see photo) She uses Series 7 brushes (000 is her favored) to limit the flow of water onto the surface. She fills in tiny gaps with tinier dabs of paint. If you touch the paint with a brush that is too damp, it instantly removes all the under lying paint! Of course, the flip side is that may errors can easily be corrected in the same way. While you can easily erase graphite from vellum, Karen transfers her finished composition using Seral paper and then lightens with a clean kneaded eraser. She also uses the eraser to remove surface oils in places where the paint beads and refuses to spread evenly. Keep hand oils off the surface to avoid this problem. While paint can be fairly easily lifted, water drops sully the surface permanently and can be seen in side light. Frame vellum with an 8 ply mat and at least ½ margin under the mat to allow for some expansion and contraction, or it can be floated. Kate Nessler had several pieces in the Portfolio Show that were stitched onto a backing and floated; the stitching was part of the composition. 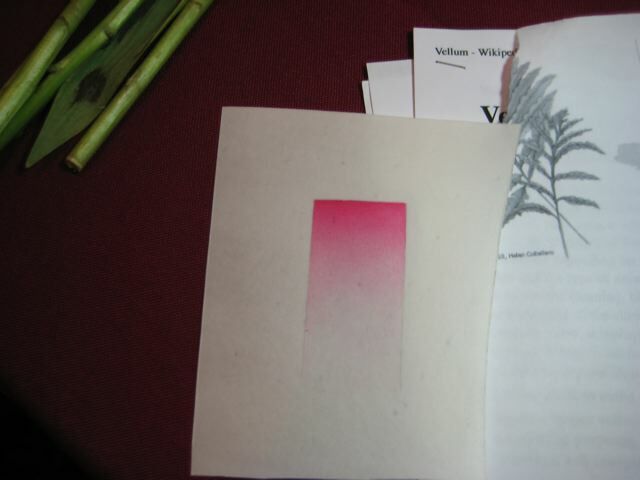 I have been fascinated and intimidated by vellum ever since I saw our Morgan Kari’s glowing painting of a clover at a BAGSC meeting several years ago at Norma Sarkin’s home. I was thrilled with this class and with Karen’s expert, content filled instruction. I am looking forward to paint in velum. My first intent trying to use water color was a disaster, the paper bubble. Thank you for the hope, what other medium can I use? Don’t give up hope! I had the same problem with my first tries — it means you’re using too much water, and not giving it time to dry between applications of paint. Try using a brush with very little water.